Performance-focused models engineered by Subaru Tecnica International, Inc.
(MISSISSAUGA) — Subaru Canada, Inc. (SCI) is pleased to announce that two new limited-edition models will be available in Canada in early 2018, designed specifically for higher performance by Subaru Tecnica International, Inc. and intended for those who are true driving enthusiasts. 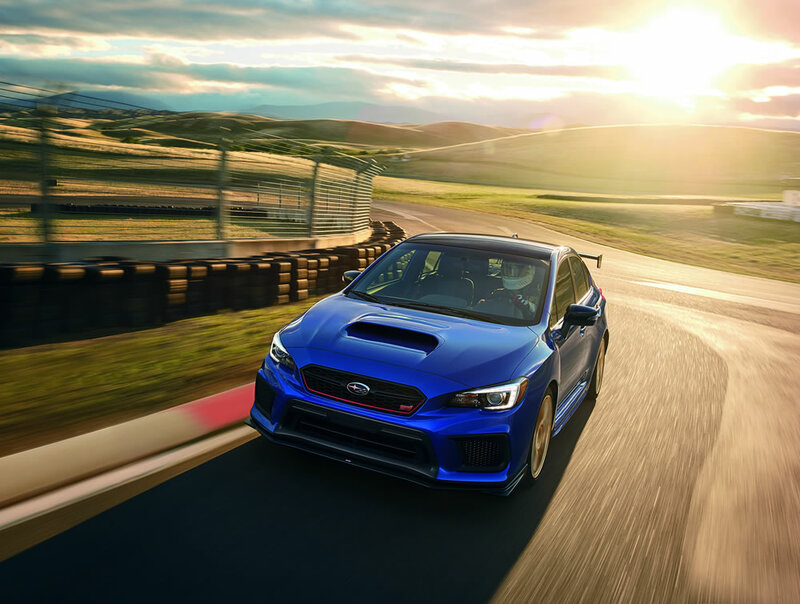 The 2018 Subaru WRX STI Type RA delivers increased performance through weight reduction, suspension improvements, and engine upgrades. Each limited-edition model comes standard with a carbon fibre roof panel, the removal of the spare tire, a carbon fibre pedestal wing and lightweight BBS 19-in. forged alloy wheels in a brilliant gold and wrapped with 245/35R19 Yokohama Advan Sports tires. The RA designation stands for “Record Attempt” and has been applied to various Subaru performance models. The original venture took place in 1989 when a competition version Subaru Legacy broke the FIA World Speed Endurance Record by clocking over 62,000 miles in 18 days and set a top speed record of 138 mph. Furthering this spirit of endeavour, a special race model WRX STI Type RA NBR Special will attempt a Nürburgring speed record this summer. Powered by a 2.5-litre turbocharged SUBARU BOXER engine, the limited edition WRX STI Type RA increases horsepower with the help of a revised STI‑specified air intake and high flow performance exhaust. A retuned ECU and stronger pistons also contribute to the increased engine performance. The 6-speed transmission features a revised third gear ratio paired with a short throw shifter. The weight reduction, additional horsepower and revised gearing all contribute to faster acceleration. Handling has been upgraded with inverted front struts and rear double wishbone suspension, all with Bilstein dampers and coil springs, while a modified multi-mode VDC gives the car better stability control to keep it on its intended path. The specially-tuned Brembo brake system, with monoblock 6-piston front calipers and dual-piston rear calipers, features an exclusive silver finish and is paired with cross-drilled rotors for better heat dissipation. In addition to the eye-catching exterior, the WRX STI Type RA cabin features Recaro performance design front seats with red bolsters and stitching as well as an embossed STI logo on the head restraints. The signature red stitching and accent trim is visible throughout the cabin. The steering wheel is wrapped in Ultrasuede for better grip and has a black gloss-finish centre spoke insert with STI logo. An exclusive red push-button start with Keyless Access is also standard equipment. Each of the WRX STI Type RA models available has been individually numbered with a plaque mounted on the centre console. The 2018 BRZ tS (tuned by STI) delivers the highest level of “fun to drive” and “pure handling delight” through greater flexibility, better control, and stability. 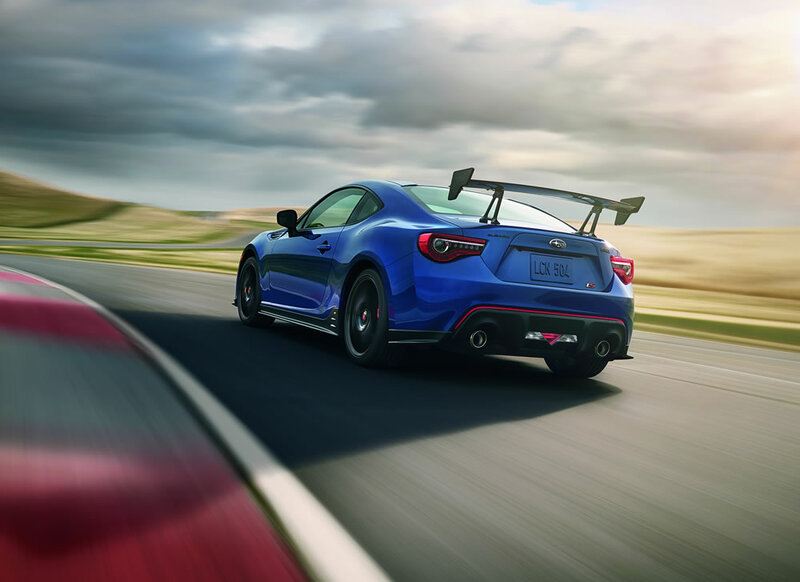 BRZ is renowned for its ultra-low centre of gravity and precision handling, and the new BRZ tS adds STI-tuned front and rear SACHS dampers and coil springs as well as flexible V-braces in the engine compartment. New draw stiffeners are added to the chassis and sub-frame to improve steering response. The BRZ tS is also equipped with 18-in. lightweight STI wheels (the first time that a BRZ has been offered with 18-inch wheels) mounted with 215/40 R 18 Michelin Pilot Sport 4 tires for superior grip and quicker turn-in. Brembo brakes at all four corners round out the package. The exterior also adds a more aggressive look with an exclusive STI rear carbon fibre spoiler that is manually adjustable to fine-tune rear downforce. The addition of STI front, rear and side underspoilers helps control airflow for better traction and stability. The BRZ tS is also adorned with an exclusive Cherry Blossom Red accent around the front grille and unique rear bumper cover. The rear trunk lid displays the official BRZ tS badge. The exterior foldable mirrors, roof-mounted shark fin antenna, BRZ and SUBARU badging all have a black finish. Also, the fog lights have been removed and replaced with STI fog light covers. The cabin features black leather and Alcantara upholstery with contrasting red stitching and accents throughout the interior, including steering wheel, door and dash panels, knee pads, shifter and emergency brake boots. The front seats have red leather bolsters and the seatbacks are embroidered with the tS logo. The visor over the gauge cluster is unique to this model, as is the interior door trim. The centre console has been updated to a cast black finish. The BRZ tS also comes standard with red front seat belts and a frameless interior rear-view mirror. Both the 2018 Subaru WRX STI Type RA and Subaru BRZ tS will be available in WR Blue Pearl, Crystal Black Silica, and Crystal White Pearl exterior colours.